Manchester, NH — Stories about citizens paying their taxes with pennies aren’t new. But how Billy Spaulding of Manchester paid his parking ticket with pennies might be a first, since he was packing a sidearm while doing so. 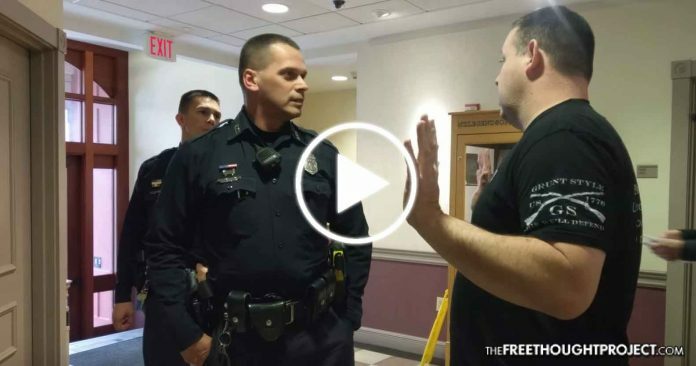 In what could be considered a political statement, the former Marine entered the county building carrying the pennies in a five-gallon bucked with the words “Policing For Profits”. After approaching the country clerk, notifying him he was paying his fine in cash, and attempting to present the pennies to the government employee, the clerk sternly refused to take his form of payment. “You’re not paying it like this!” he said. “Did we do this to you?…Did I do this to you?” the clerk asked. “Yes. You did…You have to accept this. This is how I’m paying,” he said. “Laugh all you want, I’m not playing around. I’m not having an argument here. I’m just here to pay my fine.” The clerk reminded Spaulding he’d called police. The former Marine was more than happy to inform the clerk it was he who was in violation of the law, not Spaulding. Specifically, he was in violation of the Federal Coinage Act of 1965 for refusing to receive a legal form of payment. Manchester police didn’t take kindly to Spaulding’s form of payment, and according to reports, called in a SWAT officer to deal with him. At first, the police told Spaulding he should take his form of payment to the bank to get bills instead of pennies. “You don’t have a bank account?” one officer asked. Spaulding had a friend record the scene. Although the recording does not start and stop at the beginning and the end of the encounter, it does show police intercepting Spaulding, asking him to find some other form of payment, and then telling his friend he has to stop recording because he didn’t announce he was going to do so. Refusing to allow the two citizens to record themselves paying a parking fee, is considered a violation of one’s First Amendment rights, so long as it does not interfere with the official duties of the officers. Spaulding may have recourse to file a lawsuit for both issues; refusing to receive his form of payment which resulted in his occurring additional expenditures, and his friend being forced to stop recording. Recently, an activist by the name of Phillip Turner won a judgment in the 5th Circuit Court of Appeals who ruled he does (and so does every citizen) have a right to film police. Entering a court house or a police station while being armed is also not illegal in New Hampshire. Spaulding knew that as well, but he reportedly had to take his grievance to the Sheriff’s department before he was allowed to go back to the court house and pay his parking ticket in pennies. Spaulding may have, however, missed an opportunity to have his ticket nullified. Upon having presented his form of payment, and having witnessed his payment refused, he could have asked a judge to dismiss his $75 ticket. The judge would likely have done so, being fully aware that the Coinage Act of 1965 allows all forms of U.S. currency to be used for payment. After leaving the sheriff’s office, Spaulding once again presented his $75 worth of pennies as payment for his ticket at the county courthouse. The clerk, having been notified by the sheriff to receive the former Marine’s payment, didn’t seem all too pleased to be doing so. Nonetheless, Spaulding passed through the glass window separating the two individuals, a grand total of 7,500 pennies and a $5 bill just in case he or the clerk miscounted. Below is the video of this epic encounter. Spaulding reached out to TFTP to express his gratitude and motivations for paying his parking ticket in pennies. He wrote, “I personally want to take time to thank you for covering my story. I just want all citizens to be aware that people are allowed to pay however they may choose.” For that, Mr. Spaulding, we salute you.